With all the nostalgia happening in surfing as we find a modern history, Line Up thought we would put four very different Retro models to the test. Maybe there's something to learn. Maybe just a lot of fun. Maybe just for the heck of it. Maybe for the soul of it. 1) Mark Richards twin fin 6'3" twin fin x 19 ¾ x 2 5/8 swallow tail with vee shaped by M.R. 2) Line Up Nugget with Ben Lexcon single fin 6'0" ½ x 20 ½ x 2 5/8 x 20" tail, fat as ya Mum's bum (a.k.a. McCoy Cheyne Horan model). 3) McTavish Blue Bird single fin 6'8 x 19 x 2 ¾ pin tail. 4) Line Up Retro model twin fin 5'8 x 19 ½ x 2 5/8" swallow tail. 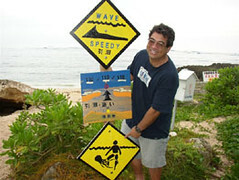 Rex Kashinaki (Hawaiian) - 49 yrs old, lives Honolulu Hawaii, shaper. Ex Ben Apia team rider. Rode McTavish Blue Bird. Comments: I get to ride lots of different boards, but it's been a long time since I've ridden a board like this. I have to admit I really enjoyed it. I was surprised how well it rode even in these small waves it actually surfed more like a tri fin. It had excellent down the line speed and easier to turn than you think. Scott Elison 36 yrs old, Floridian, now living in Okinawa Japan, weighs 85 kg. Rode M.R. twin fin. Comments: After waiting 18 months for this board of my dreams, I've got two questions after riding it. 1) Why ain't we riding more twin fins today? & 2) Why don't we use more vee in today's boards? This board is sooo much fun and forgiving in small waves. Wayne Ryan 43 yrs old, Dee Why Sydney Australia, weighs 89 kg. Rode Line Up Nugget. Comments: I've always wanted to ride a nugget like this. Cheyne Horan was my hero as a grom. To be honest I enjoyed it but was left wondering what a freak Cheyne is to ride these so well. It was easy to catch waves and very loose, but lacked drive. Maybe as a tri fin it would have worked better for me. Great fun though. 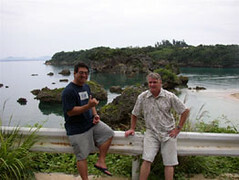 Richard Holmes (American) 27 yrs old, lives in Okinawa Japan. Rode Line Up Retro model twin fin. Comments: I love this board. It's super loose and responsive in small waves. So many other surfers ask me why I surf this board so much. The answer is simple, I get more waves than them and have more fun. Many surfers are getting mini mals etc. to surf those sloppy small days. I just use my twinny. I've actually won contests against surfers with conventional shapes. 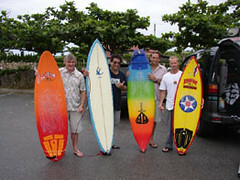 All surfers enjoyed their boards and questioned the fact that why don't more people surf these style boards? Maybe we are too cool for school or not cool enough. Just try one of Line Up's models available now.